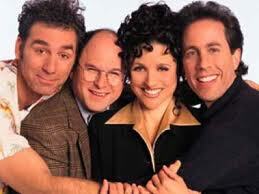 Every time I tell someone I’m writing a book about Seinfeld, they say something along the lines of: “Oh, you should call it The Book About Nothing.” This week, I’ve written a few pieces about Seinfeld in anticipation of its Hulu launch on Thursday, and almost every editor I’ve worked with has asked me to add something about it being “the show about nothing” and/or has said they plan to use a variation of the phrase in the headline. It’s not useful, like 30 Rock‘s “I want to go to there” or “Blurg.” It’s not a catch-all exclamatory phrase like Good Times‘ “Dy-no-mite!” It’s not even as funny as a lot of other Seinfeld-isms like “spongeworthy” or “master of my domain.” But people love it. I like to try to figure these things out, but maybe I’m too close to the topic this time. So I’m asking you, readers: Any ideas? What’s so interesting about “the show about nothing”? I’m guessing it’s just laziness. It’s not like they would have to dig that far to come up with about 50 other references that would work, like you mentioned. Regardless, I’m looking forward to your stories this week! I agree that there are other better “catchphrases” from the show. I think the idea of the show about nothing was kind of a glass shattering phrase (from How I Met Your Mother)–once the show put it forward, some viewers have come to see that as a good way to encompass the show. It isn’t the only definition of the show–but is an easy one for people to latch onto. I am unsure of what my definition would be. My uncle, on the other hand, would have argued that it was a show about four selfish/self obsessed people. That’s a bit negative for me, but I can see elements of what he means. Never understood that either. All sitcoms are about nothing on some level – the comedy being situation-based, or character-based. The ones that ARE about something don’t usually work for me – they feel too gimmicky. It’s the comedy of finely drawn characters that I love. And Seinfeld – like The Honeymooners, All in the Family, Mary Tyler Moore – is a comedy classic.